To be presented at SIGGRAPH 2009, New Orleans. Camera flashes produce intrusive bursts of light that disturb or dazzle. We present a prototype camera and flash that uses infra-red and ultra-violet light mostly outside the visible range to capture pictures in low-light conditions. This “dark” flash is at least two orders of magnitude dimmer than conventional flashes for a comparable exposure. Building on ideas from flash/no-flash photography, we capture a pair of images, one using the dark flash, other using the dim ambient illumination alone. We then exploit the correlations between images recorded at different wavelengths to denoise the ambient image and restore fine details to give a high quality result, even in very weak illumination. The processing techniques can also be used to denoise images captured with conventional cameras. Our camera and flash system offers dazzle-free photography by hiding the flash in the non-visible spectrum. A pair of images are captured at a blur-free shutter speed, one using a multi-spectral flash (F), the other using ambient illumination (A) which in this case is 1/100th of that required for a correct exposure. The pair are combined to give an output image (R) which is of comparable quality to a reference long exposure shot (L). Download a short report that compares our modified Fujifilm S5 Pro Dark Flash camera with the Sony DSC-WX1 camera that is noted for it’s low-light performance. The images referred to in this report can be downloaded from here. 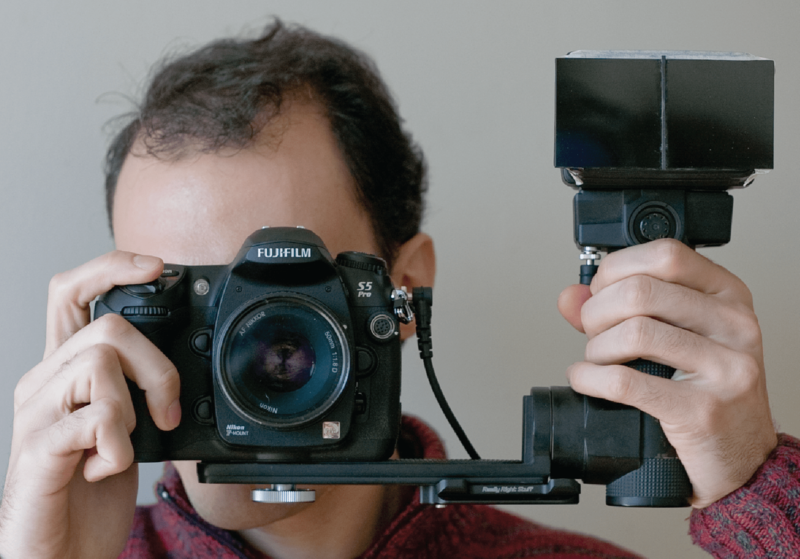 Pingback: NYU Researchers Develop An Invisible Flash | Are you reading? Pingback: Souriez, vous (n'êtes plus) flashé!